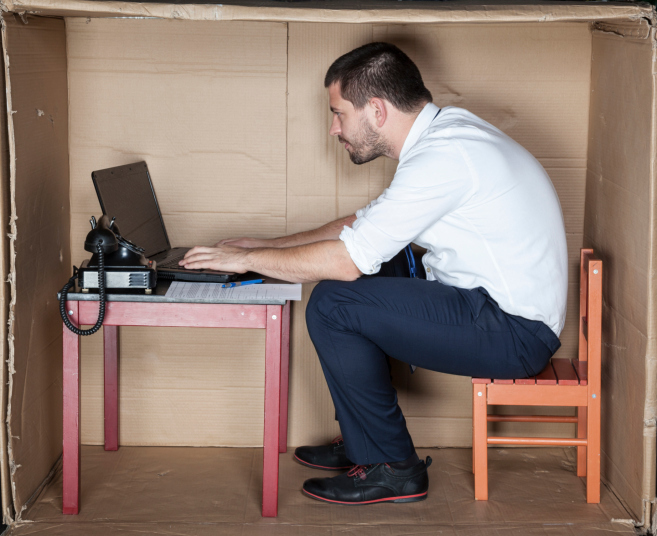 Feeling cramped at work? Try these tips to maximize a small office space. If you don’t have the luxury of a wide open floor plan at your office, there are still numerous tips and tricks you can use to get the most from your space. While cubicles are the most common and traditional way of organizing and distributing office space they are not the only option. There are also little tips and tricks you can use to make the most of your space. In a small office space, organization is extra important. It is easy to become bogged down in a sea of unnecessary minutia if you are not vigilant about what you keep, what you save, and how you organize everything. Do daily inventories of what you need and what you don’t and be sure to be free of any unnecessary clutter in order to ensure that everything runs smoothly. Depending on your space, you can even add shelves to ensure that everything you need is well-organized in a way that takes up minimal space, and is easily within reach. Be creative when approaching your space in order to get the most from it. Especially if your office focuses on teamwork and groups of people working directly on shared projects, the “2 in 1” desk is something you should definitely explore. These desks create two workstations in one and create ample storage, work area, and floor space. This innovative workspace promotes a collaborative environment with an open feel that’s vastly different from the classic cubicle set up. Cubicles can make employees feel isolated and closed off from the rest of the room, which will not foster the right kind of creative and collaborative energy that yields results in a more team oriented company. These may even be a necessity in small office spaces, where there is not enough room for every team member to have the traditional cubicle space. Furniture plays a large part in shaping the appeal of your office to both clients and employees. The overall look of your office conveys a message, so make sure it is a positive one by choosing the right furniture, whether you have a small office space or a large one to create, maintain, or manage. This entry was posted on Friday, April 8th, 2016 at 8:14 pm. Both comments and pings are currently closed.